I’m in two minds about this book. On the one hand the information is clear and occasionally slightly amusingly presented, with a recognition that there isn’t just one way to look after babies. 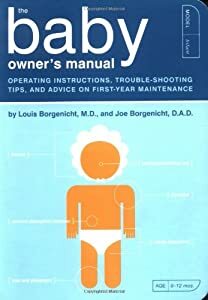 On the other, I’m uncomfortable with discussing babies as if they weren’t people (the pretence is that this the manual for a newly acquired machine of some kind). Yes, it’s a joke here, but personally I feel it’s the lack of recognition of the very young as small individuals that leads to the parenting suggestions I like least. I don’t want to be my daughter’s owner, I want to be a decent mother to her. Yes, that means being in charge for the next few years, but that’s because she needs care and education to help her develop into a capable adult, and I (and DH, of course) have been given the responsibility of giving her the attention and interaction necessary to that end. So for the most part I think well of this book – it does what it aims to in a clear and handy format that would be easy to read on the go. I have enough of a problem with the language, however, that it’s probably going to go back into our BookMooch inventory (that’s where we got it from), even though I am pleased to have read it. Here are two fun little journals to bring out the artist and/or birdlover in you. These are a pair of small booklets (each page about double the size of a credit card), on each page of which is the outline of a bird. (I’m no expert, but the shape makes me think of the small garden birds commonly seen in the British Isles.) Journallers are invited to decorate a page (or more) using that outline. (Some participants have stuck their work over the top, if inspiration didn’t involve using the given outline.) It looks like the pair have so far travelled together, though they don’t need to. There’s been a lot of very creative work done on these already, particularly in multi-media, but there are still some blank pages too. I’ve just added these to our inventory, so they’re available at the moment. I should have taken my DH’s advice, and not read this while or just after our baby was sick (he’d not brought it to the hospital when I needed reading matter, but I found it when we got home). Parts of this are depressing generally, especially when the family with a baby finally have a real discussion about what’s going on. 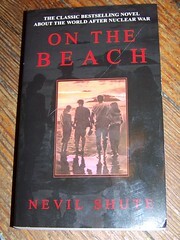 Apparently, like several of Shute’s other novels, this quickly became a now classic film. I’ve never seen that, however, and came to the book all unknowing. For an end-of-the-world novel, this is self-aware in its difference from the more American style – here the Northern hemisphere has simply been wiped out through a series of terrorist actions by rogue states, and misunderstanding reactions by large ones, and the Southern hemisphere is suffering through really no fault of its own. Scientifically, I don’t see that the premise here makes any sense at all – if the air of the North has been affected enough to wipe out all human and then animal life by a series of nuclear bombs in different places, why would the radiation be spreading evenly north to south? And if the air is affected, why aren’t the oceans? Still, suspending disbelief in this regard, the human psychology makes some sense, although I don’t believe there’d be as much uniformity about it as is presented here. Basically, he has his characters, mostly Australians based in and around Melbourne, as well as a couple of US Naval crews who were in Southern waters during the short war and who have placed themselves under Australian command, as well as all those elsewhere in Australia, South America and anywhere else that still has human population, acting fairly calmly, and happily staying in their current bases, unless there’s a job to be done elsewhere. Half of them pretend everything will continue, and plan for the future, planting gardens that they won’t be around to benefit from, while the other half party, drinking and taking any risk that takes their fancy, because it will make at most a few weeks of difference. While it’s discussed as an option, no-one comes south to them, or goes south from Melbourne, to try to survive a few days, weeks or months longer. I just don’t believe people wouldn’t try to hang on. It seems highly unlikely and defeatist to me. Again accepting an unlikely premise, however, the novel does work. People care deeply, much as they often try to hide it, and they try to make the best of a bad lot as they go, retaining joy and dignity, as it strikes them, right to the end. I’m not convinced this is one I’ll be rereading regularly, as it can’t help but be somewhat depressing, given the storyline, but I’m not sorry to have read it at all – just thinking I should have left it for another time! The thing about these lists is that there’s a lot of agreement – many of the same books just keep coming up, which is part of why I haven’t been commenting much on individual entries. Just the way this list worked out, however, there seem to be more titles that I’ve read part of, or have other things to say about, so there will be occasional comments. Not many, however. This is one I just found randomly online, and is one (seemingly well read) person’s opinion, but then so much of reading is! I do believe this is the first book both DH and I have read and reviewed on our respective blogs, so I will refer you to his take on this book for his discussion of its historicity, which leaves me to focus on how it worked for me as a novel. After all, I’m the first to admit that my prior knowledge of 19th Century North American history comes largely from novels and television series about it. What I remember most are John Jakes‘ North and South trilogy, which I saw the television series of before seeking out the books. He, having grown up in the USA, has far more knowledge of the history than I do. So, we have two main viewpoint characters in this novel, both attested real historical people, although far more is known of the one than the other. We begin with General Robert E. Lee, in charge of the Army of Northern Virginia, and alternate with one of his First Sergeants, Nate Caudell. At the opening of the novel the army is under-supplied and demoralised, up against an enemy with not only more soldiers, food and weapons, but far more technologically advanced equipment as well, and Lee as their commander is thoroughly aware of the fact. He is approached by a strangely dressed and unrecognisably accented man who offers him weapons far better than anything available anywhere, in vast numbers at a nominal price and despite some qualms about what this gift horse might be hiding in its mouth, sees some hope for his cause, the right to self-determination of his beloved state of Virginia. 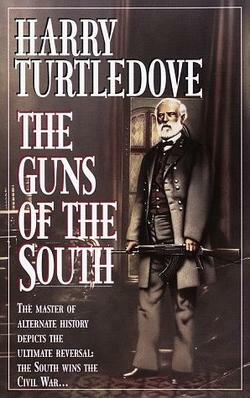 As the fortunes of the Confederate States of America dramatically change, both his hopes and his fears in the new situation are validated, and he is inescapably drawn into politics and nation-building, even when the direction his conscience takes him is completely opposite to the desires of his strange new friends of the AWB. Both Lee and Caudell, neither of whom fight on a principle of keeping slavery, but rather through loyalty to their respective states (Virginia and North Carolina), gradually grow less and less enamoured of the behaviour and arrogance of the AWB and more and more convinced that an end to slavery must come – Lee because he feels this is the way his new country must go if it is to receive any respect in the community of nations, and Caudell (who was never well-paid enough to be a slave-owner, even had he wished so to be) because his horizons are widened in the war, and he sees that given the opportunity to be so, Negroes are just as good soldiers and men as anyone else. (To simplify vastly in both cases.) Through these two perspectives, as well as the view of people around these two, we are shown how some attitudes and people can change. While the AWB men are thoroughly evil, with it being made clear although thankfully not generally shown in graphic detail that besides their supremacist ideology at least some of them are complete sadists happy to take advantage of their new ability in the past to own, control and hurt others, we are also shown that some of them at least do actually believe wholeheartedly in the supremacist position. I don’t personally see this as a redeeming feature, although I think the lack of hypocrisy is supposed to be one for at least one of the vilest characters. It is their inability to change, or to allow the Confederacy to be other than what they wanted which is ultimately their downfall, but that downfall comes at a great cost in lives of all sides. As a novel this works, and certainly I think we can all hope that even if the US Civil War had ended with two nations rather than one that slavery would still have ended shortly thereafter. Who in sanity can but be glad that’s officially gone? Now for the world to work to rid us of all forms of slavery in modern fact as well. Like Heartbeat by Sharon Creech, which I discussed here a couple of years ago, this is told in first person poetry. The topics (beyond the obvious growing in maturity, since both are about young adolescents) are quite different, however. This is a bullying story with a bit of a difference, since it’s told by a guilty ex-bully who in many ways feels he’s got off too lightly. 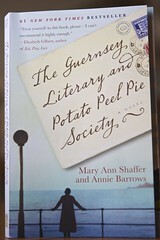 I’ve given a fair bit away, here, but it’s a very good book and well worth the read. I haven’t been listening to the current book on Forgotten Classics, but I did enjoy the previous one. I had certainly heard of Childers before Julie read this book, but hadn’t read anything of his; I hadn’t realised he pioneered the spy novel like this. Since I don’t think she’d mentioned it I’d forgotten that he ended up an Irish nationalist, and hadn’t realised until I just read the Wikipedia article linked above just how complicated his allegiences to Britain and Ireland were. I might have to look for a decent biography of the man. What Julie did explain in some detail was the political relevance and then impact the novel had on British Naval and other military preparations for the (then potential) upcoming conflicts with Germany, which really wasn’t very far away by sea. (RofS was first published in 1903.) While there’s certainly a clear message coming across about the value and importance of covert knowledge of what’s going on in other nations (especially enemies or possible ones) at a time when spying was seen as underhand and not something for gentlemen to take part in, the story is not lacking, and most of the characters come across well. In memory of Asgard II. While my baby’s still sick (although out of hospital) I don’t feel like discussing novels of death and destruction, so for the first time I’m going to skip around in the 2011 reading list and go straight to a fun and friendly children’s book. I’ve been looking out for some of Hughes’ beautiful books for very young children, but came across this novel of hers first, and thought I’d see what it’s like. I’d expected illustrations, and in fact every single page of this chapter book has a unique and appropriate picture at the top, but the story isn’t bad either. 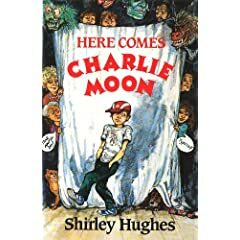 Charlie Moon lives with his Mum in a big city, and to save him being bored underfoot over the summer, she sends him to stay with his Auntie Jean, who runs a joke shop in a Welsh seaside resort, Penwyn Bay. His older cousin Ariadne (12 years old to his 10) is similarly staying with their aunt, and while the two wind each other up a bit they’re really very good companions and then friends. Neither Auntie Jean nor her neighbour and ex-colleague Carlo Cornetto are doing all that well at their tourism-based businesses, since the other end of the bay is where the modern attractions are, but Charlie and Ariadne still manage to make themselves some friends, foil the local bullies, and help to revive their Auntie’s and Mr Cornetto’s businesses through a series of quite plausible adventures. At a guess, this’d be a good one for 8-12 year olds to read themselves (boys or girls), and good for reading aloud so long as everyone’s close enough to see the line drawings, which aren’t all that large.